Kit preview of Bandai's Zwarth . Scale: 1/72 - maybe 10"/ 25cm tall when assembled. 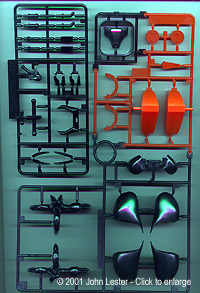 Parts: Approximately 100 (plus polycaps), injection molded styrene and PVC vinyl. Instructions: Fold-out pictorial; text in Japanese. Paint guide (of sorts) included. MSRP: 1500 JPY (about $12 US) available from HobbyLink Japan and others. I don't know anything about the Sunrise anime Aura Battler Dunbine, but I do know I like the insect-like look of the mechs. BanDai had released a series of models based on the show years ago, but these were clunky and not terribly true to what's seen on screen. 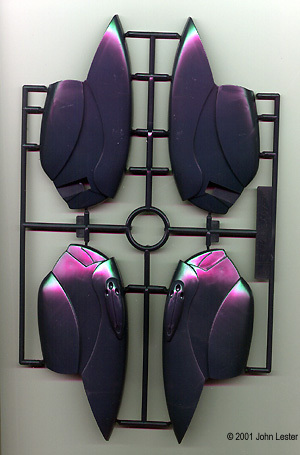 ^ Is that cool or what, how they get three colors on one sprue? ^ Paint/ color guide. For purists, Gunze-Sangyo markets a set of paints specifically for this model. ^ My two year old neice will get more use from the stickers than I will... Last year (2000), the company re-tooled the line, issuing 1/72 scale High Grade (HG) kits (four mechs so far) and a 1/35 Master Grade version of the hero, the Dunbine. The box is just jammed full of plastic. 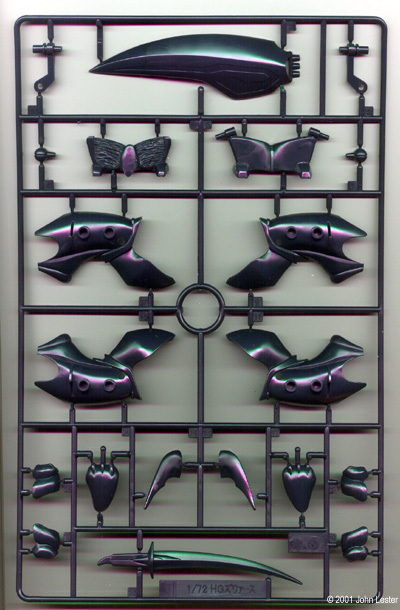 There are over 100 parts on 8 sprues, including the polycaps that allow some posability. The parts are molded in color so theoretically one doesn't have to do any painting. Most of the styrene parts are black, but there are red, transparent black and transparent light blue bits as well. The sturene parts comprise most of the body (chassis? ; after all, it is a vehicle) and weapons. The wings are made of a clear light blue vinyl, softer than the regular parts. 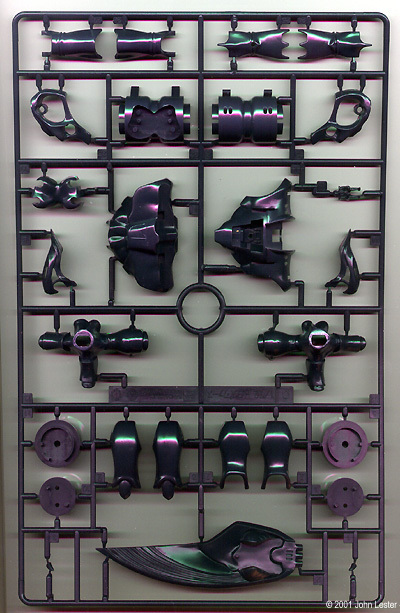 Hands and the connectors between major assemblies (i.e., "knees", "elbows", etc) are in a rubbery black PVC. Besides that monster backpack unit, the model comes with two sets of hands, an "Aura Sword," "Aura Shot," arm-mounted "Twin Aura Cannon," and a "Flame Bomb." You also get a pilot figure and a cockpit of sorts to put him in. Detail throughout is quite good. Gone are the clunky hips and simplified shapes of the early-80's releases. The detail on the hands and knees is especially crisp and fine. Those parts, however, are quite soft and flexible, and I have no idea whether they will eat away surrounding styrene over the years - like the vinyl tires on ERTL airplanes were infamous for doing. The wings have structure (veins?) molded in them which will pop right out with a decent wash. Instructions are the standard Bandai offering. You get a diagram showing all the parts and where they are on which sprue. Each assembly step consists of easy-to-follow diagrams, which is great if you can't read the Japanese text. 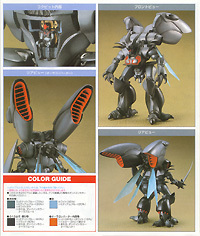 One color page shows the completed model from various angles, serving as a paint guide. Like almost every BanDai kit I've ever seen, markings are provided by foil stickers rather than waterslide decals. The places where they go should be easy enough to mask for painting instead. This kit can be snapped together - in an afternoon, if previous experience is any guide. I will, of course, be gluing my kit together. The latest BanDai jkits are normally so well-engineered that the parts align perfectly the first time. Still, I know many modelers who prefer to snap off the alignment pins so they can ensure a perfect fit every time. Painting will be .... interesting. Whether or not I ultimately decide to paint this the way it's "supposed" to look, masking off the red parts will be a challenge. They're in some awkward areas. I'll probably pre-paint everything while on the sprue, then touch up as necessary after assembly. 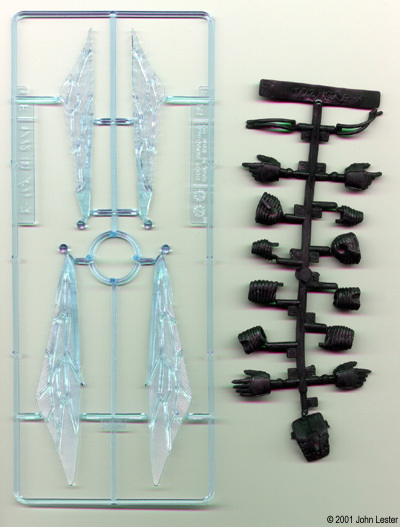 For those who are nervous about the PVC hands and connectors, or want a higher level of detail, B-Club makes a resin "detail up" set for this kit that includes new hands, claws, head and other bits. It's big, it's odd, and there's more than enough detail to have fun with ... you can't beat that with a stick. Certainly a change from all those cookie-cutter Gundam robots (oops! Did I just say that out loud?) Due to the large number of parts, it's probably not something a novice modeler wants to tackle for a first project, but anyone with a couple kits under their belt should have no problems. Recommended! This page copyright © 2001 Starship Modeler. Last updated on 29 March 2001.